The Good Reading Magazine on 06-Aug-2010 published an interview with author Cassandra Clare. We enjoyed her young adult series The Mortal Instruments and it has been on bestseller lists so her readership is large. In this interview she talks to about her latest book, Clockwork Angel. This is part of a trilogy called The Infernal Devices, which is a prequel to The Mortal Instruments trilogy, follows 16-year-old orphan Tessa Fell through Victorian London. Reading information about this new book there are mentions of steampunk technology sitting alongside her fantasy figures and, for me, this will add a new and interesting dimension to her story. From the interview we also find out that Cassandra has recently finished writing a pure steampunk story for an anthology called Steampunk! An Anthology of Fantastically Rich and Strange Stories which is coming out soon. By using all these digital resources I have learnt quite a bit about the book already and they have certainly piqued my interest. The Infernal Devices site alone is interesting and has a lot about the first title and places for information about the others already set up. This is all great publicity for the new book and I am looking forward to buying and reading it. The sites will be great to show our students and aspects of the way the publicity has been presented can be replicated by libraries to enhance and advertise their resources. Another post about Steampunk (More thoughts on Steampunk and Alternate History) has written by Richard Harland (author of Worldshaker) and posted on the Ripping Ozzie Reads Blog. I came across it last week when I was looking for sites supporting reading and writing. Richard Harland has a site devoted to giving out free tips for aspiring writers, and he offers Australian, US and British versions. I have only looked at the Australian tips. In the ROR post he muses about writing in the steampunk sub-genre. He discusses fantasy, alternate history, points of divergence from history as we know it (which he callsPODs) and tries to identify an era. I particularly like the discussion about alternate histories and that he encourages writers to think up some creative and different ways diverging from some that have begun to be a bit passe. 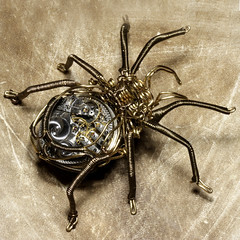 The images he used to illustrate his post are of some amazing steampunk USB’s. There are really some very inventive and clever people out there! This is not the first time Richard has written about Steampunk. On his Worldshaker site he posted a definition here. Richard’s sites are worth looking at if you are interested in many aspects of writing, not just steampunk. I can’t resist adding 2 more images. The first is a steampunk phone and the second came about as I was looking for some images for Dr Who. It turned up in a post on the Brass Googles site. Animated Explanations – Explanatory Animations Animated Explanations is a website “full of animated movies, interactive tutorials and instructional videos, all free for you to view and to embed in your website”. Yogile – Easy photo sharing! This is an easy to use photo sharing website. Looks like it could be very useful for the classroom. A whole class could easily contribute to a single album by uploading from computer, emailing or sending mms via mobile phone. You simply provide the details of your customized URL and/or Yogile e-mail address. Email notification is sent to you when new photos are added. MatthewReilly.com » News The official website for this author and his fast, action based novels. Virginia Tech | Presentation Galleries The site offers inormaion about the types of projects that Virginia Tech’s ePortfolio Initiatives have helped to develop. This page is not exhaustive of all portfolio efforts at Virginia Tech. Additionally, all portfolios are essentially reflective processes, so even these gallery exhibits are continuous works in progress, which means they are under constant revision. Keith Thompson Art The site is a gallery showcasing the art of Keith Thompson. Fantasy, Science Fiction, steampunk and alternate history vehicles and other conceptual illustration. Video Sprout Video Sprout is a web service that lets you share videos privately. This is a useful option for social networking users unhappy with the privacy settings they are offered. Your uploaded video will have a unique URL which you can copy and share; alternatively, you can send out email invitations to recipients through your Video Sprout account. I have always read science fiction so over the years that adds up to a lot of books. There have always been sub-genres to this very broad category. I have often been asked to explain the science fiction genre and its history to students. The sub-genre that has taken off in the last few years is Steampunk. I have really enjoyed the novels in this branch of science fiction. A number of books that can be labelled as “Steampunk” have been around for a while the book that has brought Steampunk to a greater audience in our library is Scott Westerfeld’s Leviathan series. The videos below offer a good explanation if you have not investigated Steampunk before. We want to create a library display about Steampunk and try to show a lot more students the books that make up this genre. We approached one of our Visual arts teachers and we will have some Year 7 student work to display later this term as well as our own 2-dimensional images for wall displays and a large screen to put on videos and other digital images. Both of these are available on-line as e-books and audio books as well as still being in print. There are many artists creating very interesting and wonderful works in the genre and many can be found on the sites below. SteamPunk magazine – The magazine is a publication that is dedicated to promoting steampunk as a culture, more than a sub-category of fiction. It is a journal of fashion, music, misapplied technology and chaos as well as fiction. Back issues can be downloaded as PDFs. Antipodean Steampunk Adventures – Australian steampunk blog. Steampod – For readers who enjoy podcasts. Appreciate Steampod where you can listen to audio stories and interviews. Below is not a book trailer but Kenneth Branagh reading an extract from the novel, Mortal Engines. It would be a good way to introduce new students to the book (and the others from the series). This is a great YA novel and one that quite a lot of our students have enjoyed. Like the newly published Leviathan by Scott Westerfeld, this is a steampunk novel and it could be enjoyed by both younger and older readers. And the Leviathan Trailer, created entirely from Keith Thompson’s art from the book. I am looking forward to reading this novel after buying it just the other day.